Closely based on the facts of the case, The Black Panther is a documentary style reconstruction of Donald Neilson's (Donald Sumpter) escalating criminal career, from robbery to murder to the kidnapping of Lesley Whittle (Debbie Farrington). For many years you couldn't. It was, predictably, controversial in the press (including those parts of it that had endangered Lesley Whittle with irresponsible reporting during the real events). Sue Lawley took director Ian Merrick to task on TV, having not seen the film herself. 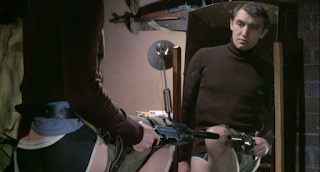 Shortly after this the film was banned, again without being viewed, by several local councils. This meant that the film had only minimal and brief distribution. There were video releases, both pre-cert and 18 rated, but these seem to have been small scale and, never re-released on video between 1981 and 2012, The Black Panther effectively vanished for more than 30 years. The Black Panther is minutely based on the real details of the case, and it is unsparing and decidedly unglamorous in the way it depicts Donald Neilson and his crimes. This is a procedural in the true sense of the word, putting us right on Neilson's shoulder in long, dialogue free, sequences as he plans and executes the last few of his many crimes. Director Ian Merrick sets the tone from the off with a title sequence showing Neilson setting up camp and preparing the tools for the first robbery we see. The methodical nature of this setup and the clear down afterwards are in sharp contrast to the robberies, which never go to plan. We get a real insight here into the mind and the workings of this psychopath; his boiling anger when something doesn't go according to his script and his pitiless, guilt free turn to violence to get out of that chaotic moment. This is a true procedural. From early on we watch as Neilson, prompted by seeing a Whittle Coaches property and a newspaper article about Lesley, the 16 year old heiress, sets up his kidnap plot. Thanks to Merrick's largely observational style, the film is firmly grounded in the real world, and this makes Neilson's planning, his walking of the park where he'll hide Lesley, his spying on her, all the more chilling. Merrick is immeasurably aided by an exceptional performance from Donald Sumpter as Neilson. Terrifying as he is during the robberies and the kidnapping, Sumpter really lets the monster in Neilson come out during the scenes between him, his wife and their teenage daughter (Marjorie Yates and Sylvia O'Donnell). Neilson, an ex-soldier, demands military precision in all things and rather than talk to his family he barks orders at them. In one especially terrifying moment, The Black Panther seems to slip out at home as, when his daughter asks if she can go out, he slips into the staccato phrasing he uses during robberies “Go out, spend money. Stupid”. It's striking that this then gives way to something truly out of character; softness, and that he uses the exact same pattern to keep Lesley calm during the kidnapping. The other performances are generally excellent, with Yates, O'Donnell and Farrington all giving interesting, if brief, portraits of women living in fear of this man. While, because of how the real case ended, it doesn't have the same nihilistic hopelessness, the film The Black Panther most recalls for me is Henry: Portrait Of A Serial Killer, to the degree that I wonder whether John McNaughton saw it before making his film. Both dwell in the mundane minutiae of an amoral criminal, not only refusing to make their actions glamorous, but showing the people who commit them as the small, unremarkable, figures they really are. You could question, throughout this film, who the real Donald Neilson was, whether the flashes of humanity he sometimes shows to his daughter and to Lesley are vestiges of a person that used to be there or whether they are just more evidence of his pure psychopathy. I think, ultimately, the film suggests that we see the real Neilson only in the final moments; a pathetic figure, weeping out of concern for himself, finally trapped. 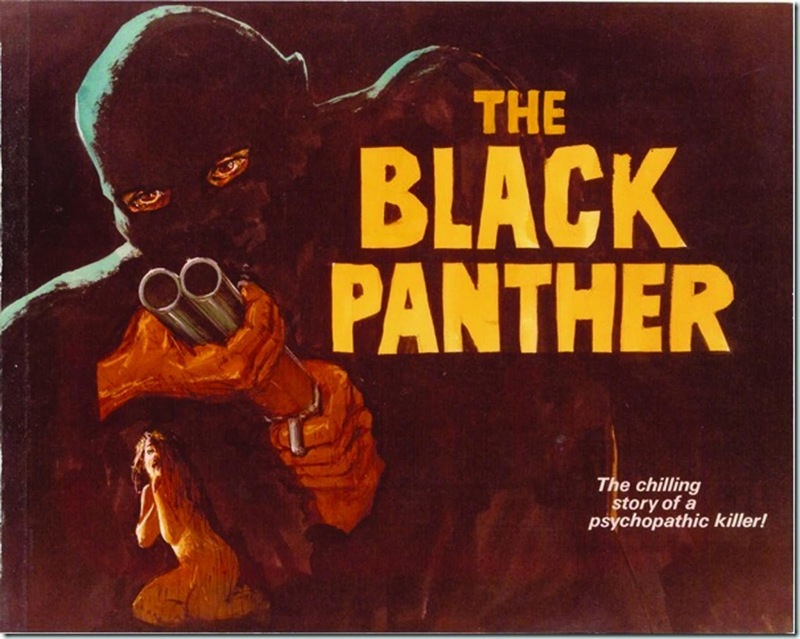 A disturbingly close and real feeling insight into a criminal and his crimes, for me, The Black Panther stands as one of the great serial killer films and as a masterpiece of true life horror. The BFI Flipside Blu Ray, which effectively resurrected the film in 2012, has a brilliant transfer and will likely remain the definitive release.